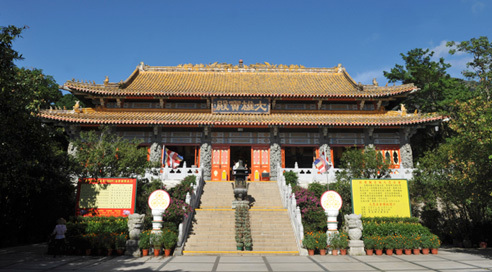 Since its founding over a hundred years ago, Po Lin Monastery has been evolving, moving forward and building, through the continuing endeavours of the abbots in the past and at present. It has since from a stone chamber and a thatched hut become a Buddhist sacred place, embodying Buddhist culture, architecture, landscape and gardening, and sculptural arts of the contemporary and the old. 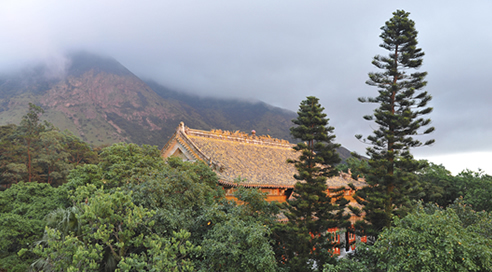 The school of Ch'an (Zen) is the most representative of Mahayana Buddhism in China. From Tang dynasty through Song, Ming and Qing, the structure of the order, the rules and disciplines, as well as the composition, the layout and the set up of Buddhist edifices and buildings, their protocols, have been well established. 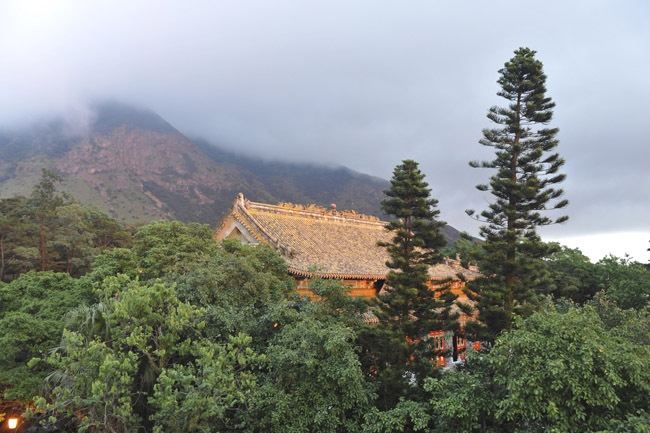 Po Lin Monastery's complex of buildings and structures, since its early days as an austere thatched hut, sits at the middle of Lantau Island, between Lantau Peak and Lei Nak Peak, on Ngon Ping, a level plateau. 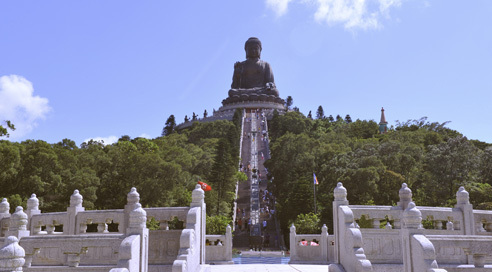 Facing the Big Buddha, the monastery's major structures sit tightly on the north-eastern to south-western axis, looking over the South China Sea. 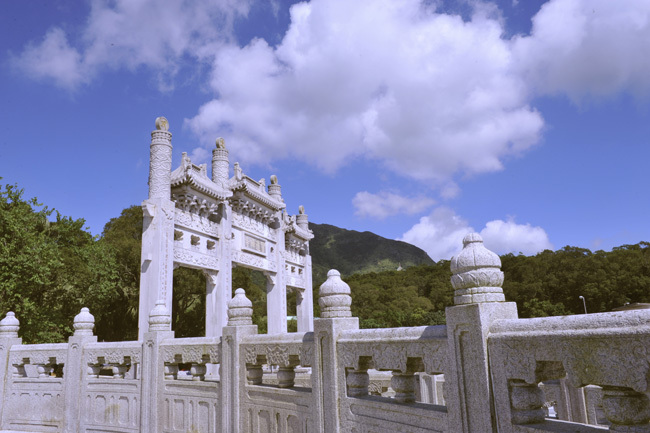 Along the axis, San Men (Mountain Gate) would lead up to the Hall of Skanda Bodhisattva, the Main Shrine Hall of Buddha, and the Grand Hall of Ten Thousand Buddhas. On the flanks, in symmetrical arrangements, are the Bell Tower and the Drum Tower, the Hall of Ksitigarbha Bodhisattva, the Meditation Hall, the Dining Hall and the Sangha Hall. These edifices combine to form an orderly monastery complex, enclosing and creating roomy space and airy courtyards. 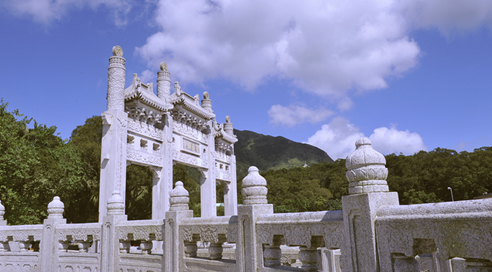 On the south side of the axis are the Po Lin Hall and the facility for ceremonial and religious activities. 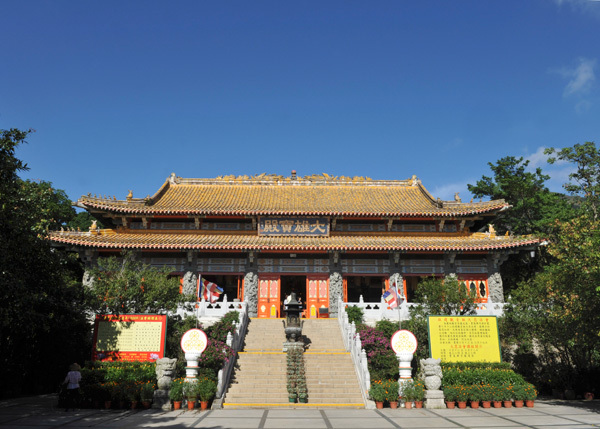 The Main Shrine Hall of Buddha was completed in 1970. 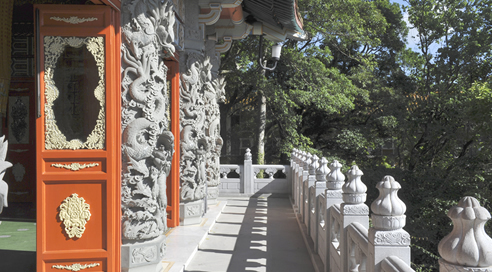 It is a seven-span structure with a double-eaves gablet roof, adopting Ming and Qing's palatial architectural design. 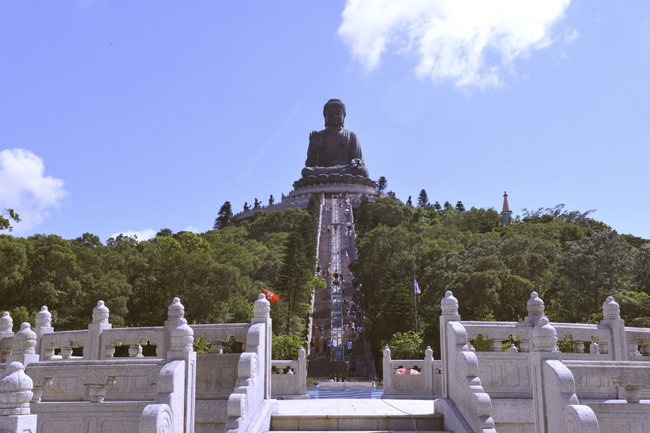 The Eighties of the last century witnessed a close and intimate relationship between Hong Kong's Buddhist order with the Mainland, and this has in no small measure facilitated the building of the Tian Tan (Altar of Heaven) Big Buddha, the construction work of which had commenced in 1981 and was completed in 1993, and Di Tan (Altar of Earth). Both have followed the design of Tian Tan's Hall of Prayer for Good Harvests, including that of the base platform. They have also incorporated the engineering and technological expertise of China's National Space Administration. The completion of the Big Buddha has indeed laid a major architectural milestone for the monastery. It also exemplifies the monastery's leading role and influence in religious orders and tourism. 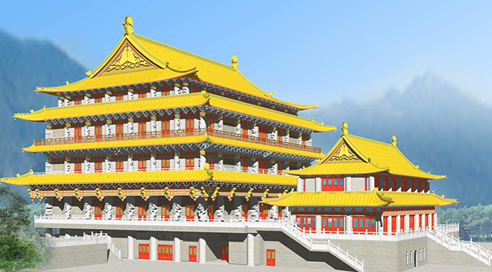 The Grand Hall of Ten Thousand Buddhas went on the drawing board in 2000 and was completed in 2014. It adopts the classical architectural concepts of Song dynasty and includes a shrine hall, an exhibition hall, a meditation hall, an abbot's chamber, a scripture library and other multi-functional facility. 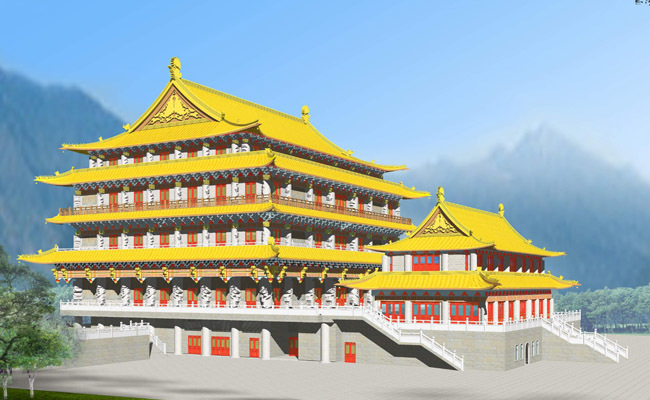 In its effort in spreading Buddhism and in moving forward towards globalization, the monastery has changed its architectural concept from local southern China to that of Beijing palatial design. 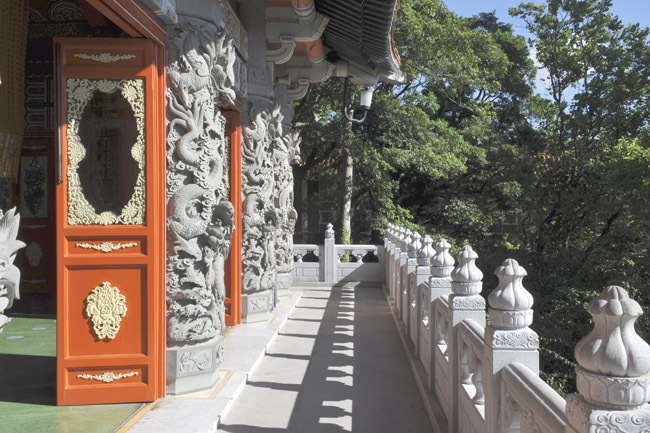 Looking back on its development in the past one hundred years, Po Lin Monastery is now looking ahead for a new stage of progress, with a renewed image of national identity.